Happy Wednesday friends! So many things to be excited about – 1) two more days until the weekend and 2) Uniqlo is just crushing it in Chicago. The Uniqlo Chicago Opening took place about a month ago (see last Uniqlo look here), and I had the pleasure of taking over their snapchat while they were in town. See the images from the takeover here. Ah, so fun! Today I’m sharing a look from the takeover – it’s the perfect city chic look to take to work. The skirt is absolute perfection – the length is totes appropriate for work with equal parts in sexiness and trendy. I love the simplicity of this look, yet how it captures chic too! The blouse and skirt both come from Uniqlo’s collaboration with a french company – does it not scream French chic? I went a little crazy with the pattern mixing and styled the spotted blouse with this pinstripe midi – the pinstripes are so subtle, but still have somewhat of an edge. The icing on the cake was walking out of the house with these pumps? Meow is all I have to say. 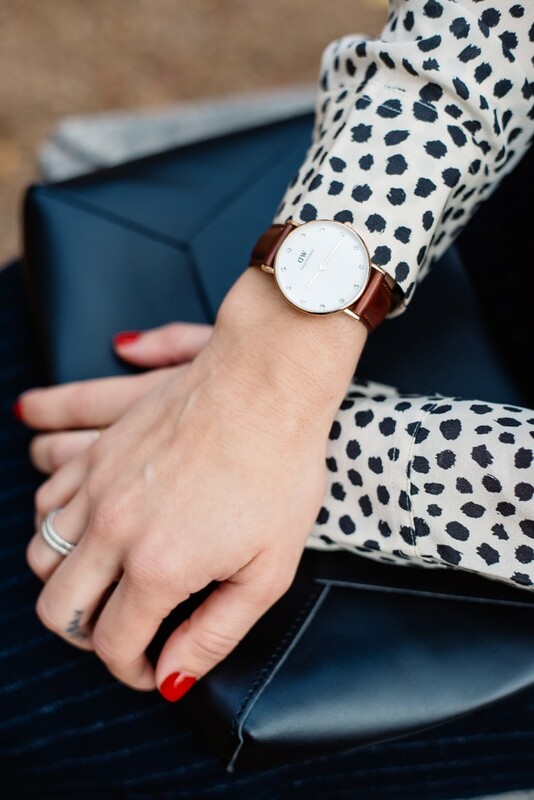 This Daniel Wellington watch is the perfect accessory for this look. I love the sophistication of this watch and how easily it can be paired with a work chic look – sub out numbers for crystals and I become an expert in telling time. From now until Dec. 31, you can order any item from Daniel Wellington for 15% off with code SPORTSANISTA. Is that the best holiday gift or what? Don’t forget to check out my gift guides for this holiday season – you can view them here. You look so very chic! Love the combination of so many prints like stripes and leopard. Thank you for sharing. Thanks Lauren! I love mixing patterns – makes for a fun day! love that top! the print mixing is perfect! YES! Totally screams French Chic! Tres Chic! Absolutely loving all the pattern mixing going on…always obsessed with that! The scenery in these pics is amazing as well! Haha thank you! Yes, the Art Institute in Chicago is truly a beautiful place, even the outdoor spaces! love uniqlo! I was able to go to their opening in NY several years ago. love all of your prints and patterns! Its such a great store and perfect for essentials and classic pieces! Im sure the store in NY is massive! Seriously loving every outfit you’ve been posting! Keep it up!! Thanks Jessica! That is so sweet of you to say! Your pictures are just always so stunning! Seriously! Your outfits are always so chic too! Thank you Courtney! That means a lot! Definitely the perfect look for work! Love the leopard top and heels! Thanks Amanda! Its such an easy day to night look! One word: perfect! I love this look and I need those pumps! Thanks lady! I hope that all is well! Chic and classy! Sounds like a great event and I love DW watches! Right? They are so pretty and feminine. You are gorgeous! I love the mix of prints and textures! I simply want to mention I am very new to blogging and site-building and seriously loved this web blog. Probably I’m want to bookmark your blog . You really have fabulous article content. Appreciate it for revealing your webpage. Hiya, I am really glad I’ve found this information. Nowadays bloggers publish just about gossip and internet stuff and this is actually annoying. A good site with exciting content, this is what I need. Thanks for making this site, and I’ll be visiting again. Do you do newsletters by email? Hey there. I discovered your site by way of Google even as looking for a similar matter, your web site got here up. It seems good. I have bookmarked it in my google bookmarks to come back then. Hello there. I discovered your site by means of Google while looking for a comparable matter, your web site got here up. It appears good. I’ve bookmarked it in my google bookmarks to come back then. Hiya, I am really glad I have found this information. Today bloggers publish just about gossip and net stuff and this is really annoying. A good blog with interesting content, that is what I need. Thank you for making this web-site, and I’ll be visiting again. Do you do newsletters by email? Hey there. I discovered your website via Google at the same time as looking for a comparable subject, your website came up. It appears good. I have bookmarked it in my google bookmarks to visit then. Hi there. I discovered your web site via Google whilst searching for a comparable subject, your site came up. It appears great. I’ve bookmarked it in my google bookmarks to come back then. Hello there. I discovered your website by way of Google whilst searching for a comparable subject, your web site got here up. It seems great. I have bookmarked it in my google bookmarks to come back then. Hello there. I discovered your blog by means of Google whilst looking for a similar matter, your website got here up. It looks good. I have bookmarked it in my google bookmarks to come back then. Hi there. I found your site by means of Google even as looking for a related topic, your site came up. It seems to be great. I’ve bookmarked it in my google bookmarks to come back then. Hiya, I’m really glad I have found this information. Nowadays bloggers publish just about gossip and internet stuff and this is really annoying. A good blog with exciting content, that is what I need. Thanks for making this site, and I’ll be visiting again. Do you do newsletters by email? Hi there. I discovered your site by way of Google while searching for a comparable topic, your website came up. It seems to be great. I have bookmarked it in my google bookmarks to visit then. Hello there. I found your web site via Google while looking for a comparable subject, your website got here up. It appears good. I’ve bookmarked it in my google bookmarks to come back then. Hiya, I’m really glad I’ve found this information. Nowadays bloggers publish just about gossip and internet stuff and this is actually irritating. A good website with interesting content, that’s what I need. Thank you for making this website, and I’ll be visiting again. Do you do newsletters by email? Hey there. I discovered your site by means of Google while looking for a similar matter, your web site got here up. It seems great. I have bookmarked it in my google bookmarks to visit then. Hi there. I found your web site by the use of Google whilst looking for a comparable matter, your web site came up. It seems to be great. I have bookmarked it in my google bookmarks to come back then. Hey there. I found your web site by means of Google while looking for a similar topic, your web site came up. It appears good. I have bookmarked it in my google bookmarks to visit then. Hi there. I found your site via Google even as looking for a comparable subject, your web site came up. It seems great. I’ve bookmarked it in my google bookmarks to visit then. Hi there. I found your website by way of Google while looking for a similar topic, your site came up. It appears great. I’ve bookmarked it in my google bookmarks to visit then. Hey there. I found your site via Google whilst searching for a similar topic, your web site got here up. It appears to be good. I’ve bookmarked it in my google bookmarks to visit then. Hiya, I’m really glad I have found this info. Nowadays bloggers publish just about gossip and net stuff and this is really frustrating. A good blog with exciting content, that is what I need. Thanks for making this website, and I’ll be visiting again. Do you do newsletters by email? Hey there. I found your blog by the use of Google at the same time as looking for a related subject, your site got here up. It appears great. I have bookmarked it in my google bookmarks to visit then. Hey there. I found your web site via Google while looking for a similar topic, your website got here up. It seems good. I have bookmarked it in my google bookmarks to visit then. Hiya, I’m really glad I’ve found this information. Nowadays bloggers publish just about gossip and internet stuff and this is really irritating. A good web site with interesting content, that’s what I need. Thanks for making this web-site, and I will be visiting again. Do you do newsletters by email? Hey there. I found your blog by the use of Google at the same time as searching for a similar subject, your web site got here up. It appears great. I’ve bookmarked it in my google bookmarks to visit then. Hello there. I found your site by way of Google even as searching for a comparable subject, your website got here up. It seems to be great. I’ve bookmarked it in my google bookmarks to come back then. Hiya, I am really glad I’ve found this information. Today bloggers publish only about gossip and web stuff and this is really frustrating. A good website with exciting content, that’s what I need. Thanks for making this web-site, and I’ll be visiting again. Do you do newsletters by email? Hello there. I found your website by means of Google whilst looking for a related matter, your web site got here up. It appears to be great. I have bookmarked it in my google bookmarks to come back then. Hey there. I found your blog via Google even as searching for a similar matter, your website got here up. It appears great. I have bookmarked it in my google bookmarks to visit then. Hey there. I found your blog by means of Google at the same time as searching for a comparable matter, your website came up. It appears to be good. I’ve bookmarked it in my google bookmarks to visit then. Hi there. I discovered your blog via Google even as looking for a related subject, your web site got here up. It looks great. I have bookmarked it in my google bookmarks to visit then. Hi there. I found your blog by way of Google whilst looking for a related subject, your site came up. It appears to be good. I’ve bookmarked it in my google bookmarks to come back then. Hiya, I am really glad I have found this information. Nowadays bloggers publish only about gossip and web stuff and this is really irritating. A good web site with interesting content, this is what I need. Thank you for making this website, and I’ll be visiting again. Do you do newsletters by email? Hello there. I discovered your site by means of Google even as looking for a related subject, your web site got here up. It seems great. I’ve bookmarked it in my google bookmarks to visit then. Hi there. I found your website by the use of Google whilst searching for a similar subject, your site got here up. It seems to be great. I have bookmarked it in my google bookmarks to visit then. Hello there. I found your website by means of Google even as looking for a related subject, your web site came up. It seems good. I’ve bookmarked it in my google bookmarks to visit then. Hey there. I discovered your website by means of Google even as looking for a related matter, your website got here up. It seems to be good. I have bookmarked it in my google bookmarks to visit then. Hiya, I’m really glad I have found this info. Nowadays bloggers publish just about gossip and net stuff and this is actually frustrating. A good blog with exciting content, that’s what I need. Thanks for making this web site, and I will be visiting again. Do you do newsletters by email? Hey there. I discovered your web site by the use of Google at the same time as searching for a similar subject, your site got here up. It seems great. I’ve bookmarked it in my google bookmarks to visit then. Hiya, I am really glad I’ve found this information. Nowadays bloggers publish just about gossip and web stuff and this is really irritating. A good site with interesting content, that’s what I need. Thanks for making this web site, and I’ll be visiting again. Do you do newsletters by email? Hi there. I found your blog by the use of Google while searching for a comparable topic, your site got here up. It appears good. I’ve bookmarked it in my google bookmarks to visit then. Hello there. I discovered your web site by the use of Google at the same time as looking for a related topic, your website got here up. It appears to be good. I have bookmarked it in my google bookmarks to come back then. Hiya, I am really glad I’ve found this information. Nowadays bloggers publish only about gossip and net stuff and this is actually frustrating. A good web site with exciting content, that is what I need. Thank you for making this website, and I will be visiting again. Do you do newsletters by email? Hi there. I found your blog via Google while looking for a related matter, your web site came up. It seems good. I’ve bookmarked it in my google bookmarks to come back then. Hey there. I found your blog by means of Google while looking for a comparable topic, your website got here up. It appears to be good. I’ve bookmarked it in my google bookmarks to visit then. Hey there. I found your site by means of Google even as looking for a comparable subject, your site came up. It appears great. I have bookmarked it in my google bookmarks to come back then. Hiya, I’m really glad I’ve found this information. Today bloggers publish just about gossip and net stuff and this is really irritating. A good blog with exciting content, that is what I need. Thanks for making this site, and I will be visiting again. Do you do newsletters by email? Hello there. I discovered your website by means of Google at the same time as searching for a comparable subject, your web site got here up. It looks good. I’ve bookmarked it in my google bookmarks to visit then. Hey there. I discovered your site by way of Google while looking for a related matter, your site came up. It seems good. I’ve bookmarked it in my google bookmarks to visit then. Hello there. I discovered your website by the use of Google at the same time as looking for a similar topic, your website came up. It appears to be great. I have bookmarked it in my google bookmarks to come back then. Hiya, I am really glad I’ve found this information. Nowadays bloggers publish only about gossip and internet stuff and this is really irritating. A good web site with interesting content, that’s what I need. Thanks for making this site, and I’ll be visiting again. Do you do newsletters by email? Hiya, I’m really glad I have found this information. Nowadays bloggers publish just about gossip and internet stuff and this is actually frustrating. A good blog with interesting content, this is what I need. Thanks for making this website, and I will be visiting again. Do you do newsletters by email? Hiya, I am really glad I have found this information. Nowadays bloggers publish just about gossip and net stuff and this is really frustrating. A good website with exciting content, that’s what I need. Thanks for making this web-site, and I’ll be visiting again. Do you do newsletters by email? Hello there. I found your blog by the use of Google at the same time as searching for a related topic, your web site came up. It appears to be good. I’ve bookmarked it in my google bookmarks to visit then. Hiya, I am really glad I have found this info. Today bloggers publish just about gossip and internet stuff and this is really frustrating. A good site with exciting content, that is what I need. Thank you for making this web site, and I’ll be visiting again. Do you do newsletters by email? Hello there. I found your blog by way of Google even as looking for a similar matter, your website got here up. It appears great. I’ve bookmarked it in my google bookmarks to come back then. Hi there. I discovered your site by means of Google at the same time as searching for a comparable subject, your web site got here up. It appears great. I’ve bookmarked it in my google bookmarks to come back then. Hiya, I’m really glad I’ve found this info. Today bloggers publish just about gossip and net stuff and this is actually frustrating. A good website with interesting content, this is what I need. Thanks for making this site, and I will be visiting again. Do you do newsletters by email? Hiya, I’m really glad I’ve found this information. Nowadays bloggers publish just about gossip and internet stuff and this is actually frustrating. A good blog with exciting content, that’s what I need. Thanks for making this website, and I’ll be visiting again. Do you do newsletters by email? Hey there. I discovered your website by the use of Google whilst searching for a similar topic, your website got here up. It looks good. I have bookmarked it in my google bookmarks to visit then. Hello there. I discovered your web site via Google even as searching for a similar topic, your web site came up. It appears to be good. I have bookmarked it in my google bookmarks to visit then. Hello there. I discovered your site by the use of Google whilst searching for a related matter, your site got here up. It looks good. I’ve bookmarked it in my google bookmarks to come back then. Hi there. I found your website by the use of Google even as searching for a similar matter, your website came up. It appears good. I’ve bookmarked it in my google bookmarks to come back then. Hi there. I found your website by means of Google even as searching for a comparable topic, your website came up. It appears to be great. I’ve bookmarked it in my google bookmarks to visit then. Hiya, I am really glad I’ve found this info. Nowadays bloggers publish only about gossip and web stuff and this is really frustrating. A good web site with exciting content, that is what I need. Thanks for making this site, and I will be visiting again. Do you do newsletters by email? Hey there. I found your site by means of Google whilst looking for a comparable matter, your site got here up. It looks great. I have bookmarked it in my google bookmarks to come back then. Hello there. I discovered your web site via Google whilst looking for a related matter, your site came up. It appears great. I have bookmarked it in my google bookmarks to come back then. Hello there. I found your blog by the use of Google while searching for a comparable topic, your site came up. It appears good. I have bookmarked it in my google bookmarks to visit then. Hello there. I discovered your website by the use of Google even as looking for a related subject, your website got here up. It seems to be good. I’ve bookmarked it in my google bookmarks to visit then. Hiya, I am really glad I have found this info. Today bloggers publish only about gossip and internet stuff and this is actually annoying. A good web site with interesting content, this is what I need. Thank you for making this web-site, and I’ll be visiting again. Do you do newsletters by email? Hiya, I am really glad I’ve found this information. Today bloggers publish just about gossip and internet stuff and this is actually frustrating. A good blog with interesting content, that is what I need. Thanks for making this site, and I will be visiting again. Do you do newsletters by email? Hi there. I discovered your web site by means of Google at the same time as looking for a related topic, your site got here up. It appears good. I’ve bookmarked it in my google bookmarks to come back then. Hi there. I found your website by the use of Google while looking for a comparable matter, your web site got here up. It looks great. I have bookmarked it in my google bookmarks to come back then. Hiya, I am really glad I’ve found this information. Nowadays bloggers publish only about gossip and web stuff and this is really annoying. A good web site with exciting content, this is what I need. Thanks for making this site, and I’ll be visiting again. Do you do newsletters by email? Hiya, I am really glad I have found this info. Nowadays bloggers publish just about gossip and web stuff and this is really frustrating. A good site with interesting content, that’s what I need. Thanks for making this web-site, and I’ll be visiting again. Do you do newsletters by email? Hiya, I am really glad I have found this info. Nowadays bloggers publish only about gossip and net stuff and this is actually irritating. A good site with interesting content, that’s what I need. Thanks for making this web site, and I will be visiting again. Do you do newsletters by email? Hey there. I found your web site by the use of Google even as looking for a comparable matter, your website came up. It appears to be good. I have bookmarked it in my google bookmarks to visit then. Hi there. I discovered your site by the use of Google whilst looking for a comparable matter, your website came up. It seems good. I have bookmarked it in my google bookmarks to visit then. Hello there. I discovered your blog via Google while searching for a comparable matter, your web site came up. It appears good. I’ve bookmarked it in my google bookmarks to visit then. Hello there. I discovered your blog by the use of Google while looking for a related topic, your web site got here up. It seems to be great. I’ve bookmarked it in my google bookmarks to come back then. Hi there. I found your web site by the use of Google even as searching for a similar subject, your website came up. It appears good. I’ve bookmarked it in my google bookmarks to come back then. Hello there. I found your site by the use of Google whilst looking for a comparable matter, your website came up. It appears great. I have bookmarked it in my google bookmarks to come back then. Hello there. I found your web site by way of Google whilst looking for a related topic, your web site got here up. It seems good. I have bookmarked it in my google bookmarks to visit then. Hey there. I discovered your blog by means of Google even as looking for a similar matter, your website got here up. It seems to be good. I have bookmarked it in my google bookmarks to come back then. Hiya, I’m really glad I have found this info. Today bloggers publish only about gossip and net stuff and this is actually irritating. A good website with interesting content, that’s what I need. Thanks for making this web-site, and I’ll be visiting again. Do you do newsletters by email? Hello there. I discovered your website by means of Google even as searching for a related subject, your website came up. It looks good. I’ve bookmarked it in my google bookmarks to come back then. Hiya, I’m really glad I have found this info. Nowadays bloggers publish just about gossip and web stuff and this is actually irritating. A good web site with exciting content, that’s what I need. Thank you for making this web site, and I will be visiting again. Do you do newsletters by email? Hey there. I found your web site via Google even as looking for a similar topic, your web site came up. It appears good. I have bookmarked it in my google bookmarks to come back then. Hiya, I am really glad I have found this information. Today bloggers publish just about gossip and web stuff and this is really frustrating. A good website with exciting content, that is what I need. Thanks for making this web-site, and I will be visiting again. Do you do newsletters by email? Hiya, I am really glad I have found this info. Nowadays bloggers publish just about gossip and internet stuff and this is actually irritating. A good website with exciting content, that’s what I need. Thank you for making this web-site, and I will be visiting again. Do you do newsletters by email? Hello there. I discovered your blog by means of Google while searching for a comparable matter, your web site came up. It looks good. I have bookmarked it in my google bookmarks to visit then. Hi there. I found your website by means of Google at the same time as searching for a related matter, your website got here up. It seems great. I have bookmarked it in my google bookmarks to come back then. Hi there. I found your blog by means of Google whilst searching for a similar matter, your web site got here up. It seems to be good. I have bookmarked it in my google bookmarks to visit then. Hi there. I found your site by means of Google while looking for a comparable topic, your site came up. It seems to be great. I have bookmarked it in my google bookmarks to come back then. Hiya, I am really glad I’ve found this info. Today bloggers publish just about gossip and internet stuff and this is really annoying. A good site with interesting content, that is what I need. Thank you for making this website, and I’ll be visiting again. Do you do newsletters by email? Hey there. I found your blog by the use of Google at the same time as looking for a similar matter, your site got here up. It appears to be good. I’ve bookmarked it in my google bookmarks to visit then. Hi there. I discovered your blog via Google at the same time as searching for a related topic, your website got here up. It looks great. I have bookmarked it in my google bookmarks to visit then. Hiya, I am really glad I have found this information. Today bloggers publish only about gossip and internet stuff and this is really frustrating. A good site with exciting content, this is what I need. Thanks for making this website, and I will be visiting again. Do you do newsletters by email? Hiya, I’m really glad I have found this information. Today bloggers publish just about gossip and net stuff and this is actually annoying. A good site with interesting content, this is what I need. Thank you for making this site, and I will be visiting again. Do you do newsletters by email? Hey there. I discovered your web site via Google while searching for a comparable topic, your site got here up. It appears good. I’ve bookmarked it in my google bookmarks to visit then. Hello there. I found your blog by way of Google whilst searching for a comparable subject, your site got here up. It seems great. I’ve bookmarked it in my google bookmarks to visit then. Hi there. I found your website by the use of Google at the same time as looking for a comparable topic, your site got here up. It looks great. I have bookmarked it in my google bookmarks to visit then. Hey there. I found your web site by the use of Google whilst looking for a similar matter, your site got here up. It looks great. I have bookmarked it in my google bookmarks to come back then. Hi there. I found your website via Google whilst searching for a related topic, your web site got here up. It appears good. I have bookmarked it in my google bookmarks to visit then. Hi there. I discovered your blog by way of Google even as looking for a similar subject, your web site got here up. It looks good. I have bookmarked it in my google bookmarks to come back then. Hiya, I am really glad I’ve found this info. Nowadays bloggers publish just about gossip and web stuff and this is really irritating. A good blog with interesting content, that’s what I need. Thanks for making this web-site, and I will be visiting again. Do you do newsletters by email? Hey there. I found your site by way of Google even as looking for a related subject, your website came up. It appears great. I have bookmarked it in my google bookmarks to come back then. Hiya, I’m really glad I’ve found this information. Today bloggers publish only about gossip and internet stuff and this is actually annoying. A good site with exciting content, this is what I need. Thanks for making this web site, and I’ll be visiting again. Do you do newsletters by email? Hey there. I found your site by way of Google while looking for a similar matter, your web site got here up. It seems to be good. I’ve bookmarked it in my google bookmarks to come back then. Hi there. I found your blog by way of Google while looking for a comparable subject, your website got here up. It seems great. I’ve bookmarked it in my google bookmarks to come back then. Hi there. I discovered your web site by way of Google whilst searching for a similar subject, your site came up. It seems good. I have bookmarked it in my google bookmarks to visit then. Hiya, I am really glad I have found this info. Nowadays bloggers publish only about gossip and net stuff and this is really frustrating. A good web site with interesting content, that is what I need. Thanks for making this website, and I will be visiting again. Do you do newsletters by email? Hey there. I found your web site by means of Google whilst looking for a related matter, your web site came up. It seems to be great. I’ve bookmarked it in my google bookmarks to visit then. Hiya, I am really glad I’ve found this info. Nowadays bloggers publish just about gossip and net stuff and this is really annoying. A good site with interesting content, that is what I need. Thank you for making this website, and I will be visiting again. Do you do newsletters by email? Hi there. I discovered your site via Google even as searching for a comparable subject, your website got here up. It appears to be great. I have bookmarked it in my google bookmarks to come back then. Hiya, I am really glad I have found this info. Nowadays bloggers publish just about gossip and internet stuff and this is really annoying. A good blog with interesting content, that’s what I need. Thanks for making this website, and I will be visiting again. Do you do newsletters by email? Hello there. I found your web site by way of Google at the same time as searching for a similar topic, your website got here up. It seems good. I’ve bookmarked it in my google bookmarks to come back then. Hello there. I discovered your web site via Google even as searching for a related topic, your website got here up. It looks good. I have bookmarked it in my google bookmarks to come back then. Hiya, I am really glad I’ve found this info. Today bloggers publish only about gossip and internet stuff and this is actually irritating. A good blog with exciting content, this is what I need. Thanks for making this site, and I will be visiting again. Do you do newsletters by email? Hiya, I am really glad I have found this info. Today bloggers publish just about gossip and net stuff and this is actually frustrating. A good blog with interesting content, that is what I need. Thank you for making this website, and I’ll be visiting again. Do you do newsletters by email? Hiya, I’m really glad I’ve found this information. Nowadays bloggers publish just about gossip and internet stuff and this is actually frustrating. A good site with exciting content, that’s what I need. Thank you for making this web-site, and I will be visiting again. Do you do newsletters by email? Hiya, I am really glad I have found this info. Nowadays bloggers publish just about gossip and internet stuff and this is actually irritating. A good web site with interesting content, that’s what I need. Thank you for making this web-site, and I’ll be visiting again. Do you do newsletters by email? Hiya, I’m really glad I’ve found this information. Nowadays bloggers publish only about gossip and net stuff and this is actually frustrating. A good web site with interesting content, that is what I need. Thank you for making this site, and I’ll be visiting again. Do you do newsletters by email? Hi there. I found your blog via Google while looking for a comparable subject, your site got here up. It seems to be great. I have bookmarked it in my google bookmarks to visit then. Hey there. I discovered your site by the use of Google while looking for a related matter, your web site got here up. It appears to be great. I’ve bookmarked it in my google bookmarks to come back then. Hello there. I discovered your web site by the use of Google while looking for a related topic, your website came up. It appears to be good. I’ve bookmarked it in my google bookmarks to come back then. Hello there. I discovered your website by means of Google whilst searching for a related subject, your web site came up. It appears great. I have bookmarked it in my google bookmarks to visit then. Hiya, I’m really glad I have found this information. Today bloggers publish just about gossip and web stuff and this is really irritating. A good web site with exciting content, this is what I need. Thanks for making this web site, and I’ll be visiting again. Do you do newsletters by email? Hiya, I’m really glad I’ve found this information. Today bloggers publish only about gossip and net stuff and this is really irritating. A good site with interesting content, that’s what I need. Thanks for making this site, and I’ll be visiting again. Do you do newsletters by email? Hiya, I am really glad I have found this information. Today bloggers publish just about gossip and web stuff and this is really frustrating. A good site with exciting content, that’s what I need. Thank you for making this site, and I’ll be visiting again. Do you do newsletters by email? Hiya, I am really glad I have found this info. Today bloggers publish only about gossip and net stuff and this is really annoying. A good web site with exciting content, this is what I need. Thank you for making this web-site, and I will be visiting again. Do you do newsletters by email? Hello there. I found your site by means of Google while looking for a comparable subject, your website came up. It appears to be good. I have bookmarked it in my google bookmarks to visit then. Hiya, I’m really glad I’ve found this information. Nowadays bloggers publish just about gossip and net stuff and this is really frustrating. A good site with exciting content, this is what I need. Thank you for making this web site, and I’ll be visiting again. Do you do newsletters by email? Hiya, I’m really glad I have found this information. Nowadays bloggers publish only about gossip and net stuff and this is actually irritating. A good web site with exciting content, that is what I need. Thank you for making this web site, and I will be visiting again. Do you do newsletters by email? Hey there. I discovered your blog by way of Google whilst searching for a related topic, your site got here up. It seems good. I have bookmarked it in my google bookmarks to come back then. Hey there. I found your blog by way of Google even as looking for a similar topic, your website came up. It seems good. I’ve bookmarked it in my google bookmarks to come back then. Hello there. I found your blog by way of Google while searching for a comparable subject, your site came up. It seems good. I’ve bookmarked it in my google bookmarks to visit then. Hi there. I discovered your site by the use of Google while looking for a similar topic, your website got here up. It looks good. I have bookmarked it in my google bookmarks to visit then. Hi there. I found your site by the use of Google whilst looking for a similar matter, your website got here up. It appears good. I’ve bookmarked it in my google bookmarks to visit then. Hello there. I discovered your blog by the use of Google while looking for a related topic, your web site came up. It seems to be great. I have bookmarked it in my google bookmarks to come back then. Hello there. I discovered your blog by the use of Google at the same time as looking for a related matter, your web site got here up. It appears great. I have bookmarked it in my google bookmarks to come back then. Hiya, I’m really glad I’ve found this info. Nowadays bloggers publish only about gossip and net stuff and this is really annoying. A good site with exciting content, this is what I need. Thanks for making this site, and I will be visiting again. Do you do newsletters by email? Hello there. I found your site by means of Google even as searching for a related subject, your site got here up. It seems good. I’ve bookmarked it in my google bookmarks to visit then. Hello there. I found your web site by way of Google whilst searching for a similar matter, your website came up. It seems to be great. I have bookmarked it in my google bookmarks to come back then. Hiya, I am really glad I have found this information. Today bloggers publish only about gossip and net stuff and this is really annoying. A good site with exciting content, that is what I need. Thanks for making this web-site, and I’ll be visiting again. Do you do newsletters by email? Hiya, I’m really glad I’ve found this info. Nowadays bloggers publish only about gossip and web stuff and this is actually frustrating. A good blog with exciting content, that is what I need. Thank you for making this website, and I will be visiting again. Do you do newsletters by email? Hiya, I am really glad I’ve found this info. Today bloggers publish just about gossip and web stuff and this is actually annoying. A good site with interesting content, that’s what I need. Thank you for making this website, and I’ll be visiting again. Do you do newsletters by email? Hey there. I found your website by the use of Google even as looking for a related subject, your website got here up. It appears good. I’ve bookmarked it in my google bookmarks to come back then. Hi there. I found your web site by means of Google even as searching for a similar matter, your web site got here up. It appears to be great. I have bookmarked it in my google bookmarks to visit then. Hello there. I discovered your website by means of Google while searching for a comparable topic, your website got here up. It seems good. I’ve bookmarked it in my google bookmarks to visit then. Hello there. I discovered your site by the use of Google even as searching for a related matter, your site came up. It appears great. I have bookmarked it in my google bookmarks to come back then. Hey there. I discovered your site by way of Google even as searching for a comparable matter, your website got here up. It appears great. I have bookmarked it in my google bookmarks to come back then. Hey there. I discovered your blog by means of Google whilst searching for a related matter, your site came up. It appears to be good. I’ve bookmarked it in my google bookmarks to visit then. Hi there. I discovered your web site by the use of Google while looking for a related matter, your website got here up. It appears great. I have bookmarked it in my google bookmarks to come back then. Hello there. I found your web site by means of Google even as looking for a related matter, your site came up. It appears great. I have bookmarked it in my google bookmarks to come back then. Hello there. I found your blog by way of Google even as searching for a comparable matter, your website came up. It appears to be great. I’ve bookmarked it in my google bookmarks to come back then.